It was during my time @Novell, when we had to deal with a lot of complex customer scenarios in PSO. We were using Virtual PC from Connectix those days. When they were acquired by Microsoft®, Novell internally switched to VMware Workstation – that was 2003. Originally I was planned to be in the first group of 10-15 people doing the defences, but due to my busy schedule I was not feeling comfortable to be able to prepare my design in 10 business days. So it took me about 3 months to prepare. The first and utmost important thing is to accept that this certification will require experience. It will be very hard to achieve with little or no experience in the field actually doing design work. Secondly I strongly recommend taking your time to prepare, do not rush anything or spend all your spare time with the application. Better go for the next defence round then burning out on trying to meet unrealistic timelines. I have been able to sit on more than 90 defence panels and the amount of knowledge that I have gained through this about different ways to design, think and communicate is endless. My new journey would be far better planned, organized and structured. And would take much more time. I have not done a lot of things in my life that made such a difference for my career, but also for me as a person. 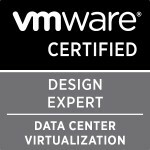 In VMware PSO I was promoted to Consulting Architect (during that time it was a hard requirement to be VMware Certified Design Expert). In addition to that it has opened so many doors, enabled so many opportunities to influence the way the company would evolve that I can only strongly recommend anyone to pursue this certification.